Last Thursday, I wrote about green shoots in the stock market. Until former Fed chair Ben Bernanke used that phrase on 60 Minutes in March 2009, I had absolutely no idea what it meant. Later I learned that after a forest fire burns everything to the ground, the landscape becomes incredibly rich with nutrients and these little “green shoots” spring up as the first sign of new life. Eventually, these shoots become trees that grow very tall over time. Of course, Bernanke was referring to the economy at the very nadir of the financial crisis. While the economy and markets saw nothing even remotely close to the 2007-2009 period, a number of my short-term indicators and investment models were sprouting green shoots last week. That was tough for me to reconcile as none of the concerns I have voiced for the past few months have been allayed. Nonetheless, the data are the data and they did push me back to being more positive on stocks, if only for a few weeks or a few months. We will have to see. Friday’s stock market action was constructive. Semis and discretionary led. Index leadership was good. More than 80% of the shares traded on the day were in stocks that went up although I would really prefer to see a 90% day or two. Finally, price remains in the middle of the recent range as seen below. Three months after the mini-waterfall decline, prices are still bound. You can see the blue horizontal line as well as the light blue down sloping line. While it will be late, having prices close above both lines should confirm the bulls are firmly in charge and stocks will be rallying to revisit the January 26 all-time peak. 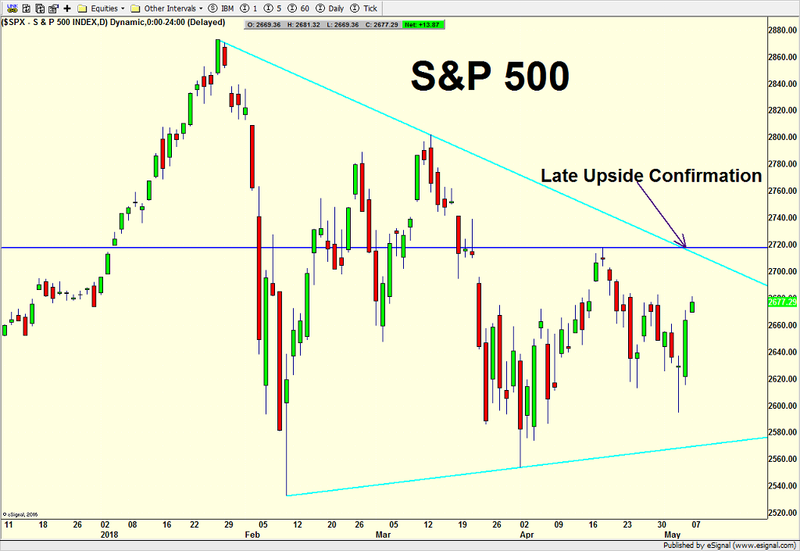 Let’s round up and call it 2720 or so on the S&P 500. As expected by almost everyone, the Fed stood pat on Wednesday. I was shocked to hear some pundits predicted a rate hike. That’s one of the dumbest forecasts I have heard in an awfully long time as the Fed has become almost too transparent and too accommodating to the markets. A rate hike out of nowhere?!?! That made me laugh out loud. Stocks sold off after the announcement for the second straight Fed meeting, in direct contradiction to one of the Fed trends I write about. We’ll have to see going forward if that edge is being arbitraged away or just temporarily not working. As I mentioned, stocks sold off yet again yesterday even though tech behemoth Apple saw very strong earnings. So much for the pundits’ smug comments about Apple leading stocks and record earnings insulating stocks from decline. The stock market continues to be under pressure, but there doesn’t seem like there is much urgency nor panic. That would be better for the intermediate-term. While I am starting to see some positive signs beneath the surface (green shoots??? ), I think it would be healthier for the bulls if the Dow could see a mini plunge towards 23,000. Looking at risk/reward, it looks like Dow 23,000 on the downside with the reward being 27,000 over the next quarter or so. That favors the bulls, but it will certainly not feel so good if stocks fall to new 2018 lows first. None of the four key sectors are getting much love, especially semis. Neither are junk bonds. Leadership looks very narrow right now and really concentrated in commodities and energy. That doesn’t exactly warm the heart of the long-term bulls as this is classic late stage behavior and does warn that the next rally could be the last one in the 9 year old bull market. However, let’s not forget that the NYSE Advance/Decline Line recently made a new high, even if only by a whisker. That usually insulates stocks from a bear market for the next 3 to 21 months. In our case, I don’t think it will be the latter. As with every Federal Open Market Committee (FOMC) statement day, there is a model for the stock market to follow pre and post announcement. Certain environments have very strong tendencies while others do not. Over the past few meetings, many of the strongest trends were muted. As with most statement days, the model for the day calls for stocks to return plus or minus 0.50% until 2:00 PM. There is a 90% chance that occurs. If the stock market opens outside of that range, there is a strong trend to see stocks move in the opposite direction until 2:00 PM. For example, if the Dow opens down 1%, the model says to buy at the open and hold until at least 2:00 PM. With stocks somewhat on the defensive lately, the next model calls for stocks to close higher today and rally after 2:00 PM. That is usually a very strong trend, 80%+, but it would have been stronger in magnitude had Tuesday’s early weakness not been overcome. Last meeting, this trend did not work as early strength on Fed day was sold in to and then piled on. The Fed is going to take no action today. At best, their commentary will be benign. At worst, Powell and company will upgrade their economic forecast which will also increase the likelihood for three or even four more rate hikes this year. June becomes the “live” meeting where rates should go up by another 1/4%. Then September and December. Back in January, I forecast 3.5 rate hikes this year with the risk to the upside. I am standing by that. To reiterate what I have said for more than a year but a little more bluntly, the Fed is misguided, arrogant and in desperate need of help. NEVER before have they sold balance sheet holdings in the open market AND raised interest rates. In fact, I don’t think it’s ever been done in the world before. So why on earth do they believe they will so easily be successful? This grand experiment is going to end poorly and we are all going to suffer at the hands of the next recession which I stabbed in the dark as beginning between mid 2019 and mid 2020. Yes, with banks holding $2.5 trillion on their balance sheets, the recession should be mild and look nothing like 2007-2009. And yes, this expansion will be more than 10 years old. And yes, there will be some external trigger like 9-11 or the S&L Crisis to push the economy over. But the Fed will have greased the skids sufficiently for the economy to recess. Let’s remember that the Fed was asleep at the wheel before the 1987 crash. In fact, Alan Greenspan, one of the worst Fed chairs of all-time, actually raised interest rates just before that fateful day, stepping on the throat of liquidity and turning a routine bull market correction into a 30% bear market and crash. In 1998 before Russia defaulted on her debt and Long Term Capital almost took down the entire financial system, the Fed was raising rates again. Just after the Dotcom Bubble burst in March 2000, ole Alan started hiking rates in May 2000. And let’s not even go to 2007 where Ben Bernanke whom I view as one of the greats, proclaimed that there would be no contagion from the sub prime mortgage collapse. Below is a chart I have shown at least quarterly since 2008. With the exception of a brief period from mid 2009 to mid 2010, the velocity of money collapsed. It’s still too early to conclude, but it does look like it stopped going down in 2017 and might be just slightly starting to turn up. If 2017 does turn out to be the bottom, this could could eventually lead to the commodity boom I see for the 2020s, especially ex energy. In the easiest terms, M2V measures how many times one unit of currency is turned over a period of time in the economy. As you can see, it’s been in a disastrous bear market since 1998 which just so happens to be the year where the Internet starting becoming a real force in the economy. Although it did uptick during the housing boom as rates went up, it turned out to be just a bounce before the collapse continued right to the present. This single chart definitely speaks to some structural problems in the financial system. Money is not getting turned over and desperately needs to. The economy has been suffering for many years and will not fully recover and function normally until money velocity rallies. This is one chart the Fed should be focused on all of the time. It would be interesting to see the impact if the Fed stopped paying banks for keeping reserves with the Fed. That could presumably force money out from the Fed and into loans or other performing assets. It continues to boggle my mind why no one called the Fed out on this and certainly not Yellen at her quarterly press conferences. Hopefully, someone will question Chairman Powell on this next month. The month of May begins today. It’s supposed to be spring although you wouldn’t know it in New England on Monday as folks had on hats, gloves and down jackets. The weather is finally looking up in CT as the forecast calls for 70s and 80s this week. I think the bulls are hoping their forecast heats up this week as it’s been cold for stocks of late. As you know from my blog posts since April 18 I have been much more concerned that the February and April lows could give way to a quick elevator shaft decline towards or below 23,000 on the Dow. It’s a scenario I am watching closely. I would feel a whole lot better for the bulls if we saw some confirmation in the form of a day or two where at least 80% of the volume (shares traded) was in stocks advancing. 90% would be even better. This kind of conviction has been sorely missing since the rally began. Turning to May which was really the point of this update, like January, there are a number of trends that fire off, both short and intermediate-term. Let’s review them and give proper attribution. 2 – Today is the first day of the month in an ongoing bull market. The previous month closed poorly. 80% of the time, today is an up day with limited downside when the trend doesn’t work. 3 – May 1 begins the “Sell in May and go away” (SIMGA) trend that lasts until November 1. In other words, it’s the weakest 6 months of the year, averaging a gain of 1.5% versus 7% for the other 6 months. However, since the bull market began, only 2011 saw any weakness greater than 1% so that trend has been somewhat muted. 4 – I tweaked SIMGA to look at just those in midterm election years which has historically been a weak year. That worked tremendously well through 2002 with some real doozies on the downside including double digit declines in 2002, 1990 and 1974. Overall, stocks rallied just 1% since 1950. 5 – I further tweaked SIMGA to only examine the first term of a president’s midterm election year which have yielded the weakest of the weak results. 1974 drops off but so do some gains. Overall, it didn’t yield much. Stocks averaged a paltry 0.73% since 1950. 6 – Finally, as I was starting to research what happened when stocks were down through April and SIMGA began, Jason Goepfert from Sentimentrader.com published the results so I will just copy his. I wish I could say “great minds think alike”, but I wouldn’t denigrate him by putting him in my category. When the year was down through April 30, SIMGA was also down by almost 3%. Does all this even mean anything? I draw two loose conclusions. First, in the short-term, today is supposed to be up. If it’s not, regardless of what happens with the Fed tomorrow, I think stocks will continue lower and further open the scenario for a full breaks of the 2018 lows. Second, there is enough of a seasonal tailwind through Halloween to suggest guarded optimism at best. In other words, when our models are not fully positive, it’s time to play defense and not be complacent. This is such a far cry from what I have written about 80% of the time since the bull market began 9 years ago. Now is definitely not the time to be cavalier and and regard every decline as a buying opportunity with an easy recovery period. While I still absolutely do not believe the bull market is over and Dow 27,000 is coming, risk has increased dramatically this year and investors should be on guard. As always, we will take it one day at a time and assess the evidence. If you have any questions or would like to schedule a meeting or call, please contact the office or click here for my calendar.